I had hire globalassignmenthelp.com for the completion of my dissertation and I can say is that I made awful mistake. I knew I couldn’t handle my dissertation by myself, also, I knew I wouldn’t get it done on time. Once I completed some research, and after reading reviews on globalassignmenthelp.com, I was convinced they had the best professionals to handle the job, but the job I got was terrible, with numerous grammar and spelling errors. The job I got was weaker than the reviews I read, I had to spend several days to tidy things up and make it more presentable. Globalassignmenthelp.com seemed to be alright when I first hire them, but things changed quickly as my emails were repeatedly ignored. I waited for a while to evaluate the quality of services they rendered according to the money they charge. Considering the amount I wasted on this job, I would say hiring globalassignmenthlp.com was a complete pointless one. They didn’t do what I expected of them and I had to fix so many things by myself in the end. Despite reading several reviews on globalassignmenthelp.com, with many reviews reporting that the website offers the best prices in the industry. This is the first time I am using the website and I don’t think the prices are worth the results I got. 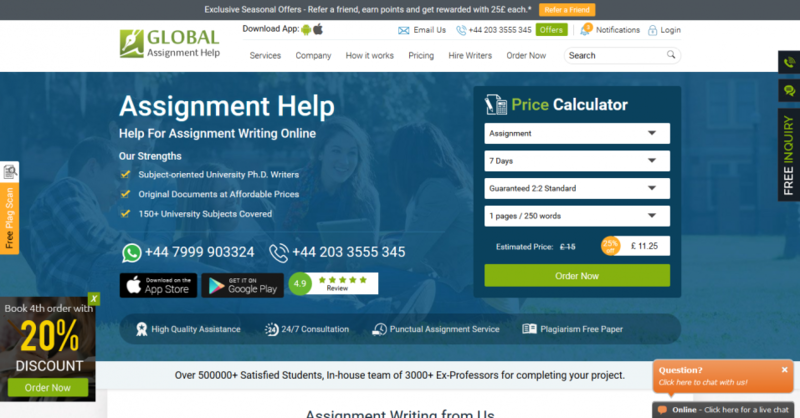 The prices were extremely too high for what I was promised, I wasn’t expecting to correct so many errors in my dissertation after hiring this company hence I am scoring the site low on prices. I am scoring this website low for the support I received during and after my dissertation. None of the emails I sent during the progress of my work, was responded to, and that got be anxious. I had informed them of the need to constantly get in touch with them in the course of completing the dissertation, and the work I received in the end did not meet the standards as I add to add references by myself in order to receive a decent grade. I wish future clients on globalassignmenthelp.com will read more reviews and figure out what is actually going on here. I cannot give a good review about this website when the result I obtained was actually different from what I was promised. I wouldn’t have paid for their services if I had expected this sort of result in the beginning. My consolation is that I had to leave few days beside the deadline I gave globalassignmenthelp.com, just to correct all the errors. I am giving a low core for globalassignmenthelp.com after a terrible experience with the website. The score here reflects and conclude the type of service I got here, I wasn’t expecting the type of services I got here because they were totally different from what I read in the reviews posted on the website. Doing business with this website is a complete waste of money because I had to spend up to 3 days just making corrections. Till this moment, I am still waiting for their response, or at least get some compensation for the terrible job done hence I hope they will read this review and upgrade their poor services. The author of the review above seems to be exaggerating a little bit but the company with such a loud name – Globalassignmenthelp.com – is rather mediocre. Or maybe algebra is not just their forte.